Simple push fit assembly required approx. 5 minutes no tools necessary. Easy clean material and robust design. Colours: Grey Green & Pink. Material: Plastic. Weight: 850 grams. Handmade Luxury Three tiers Pet house ! Luxury Pet beds handmade to a very high standard. Ideally for two or more cats.or small dogs. Will fit small dog, cat, kitten, rabbit and other small animals. 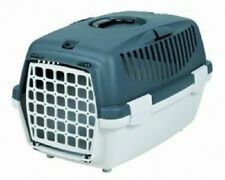 Portable Plastic Grey Pet Carrier. Grey colour. Ideal for transporting your pet. Plastic material. Size is approx. 46 x 31 x 32 cm. Wicker Pet Carrier. Handmade to carry cats, small dogs and other pets. the length of the base inside 39 cm/ 15". the width of the base inside 45 cm/17,5". Wicker Pet Carrier. Traditional Hand Made. Isle of Man & Isle of Scilly Northern Ireland Republic of Ireland Channel Islands. 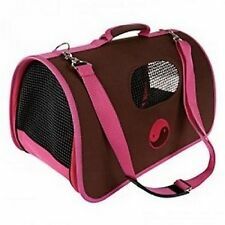 This pet carrier is ideal for the transport of cats, small dogs and other small animals. It has a holding device for the car seat belt which makes the transport more secure. Product Features. During that process you will be issued with an RMA number. This pet carrier is the perfect item for transporting your pet. With a secure spring locked door, this pet carrier features ventilation slits at the side, a carry handle and has a sturdy construction making sure your pet is safe and sound. Wicker small pet carrier. 2 back windows. back windows (no covering) about. 75" x 1.75". front door with wire window. rounded top, flat bottom. top handle. 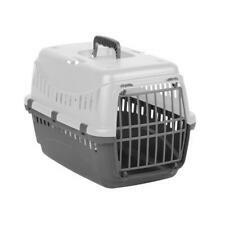 Grey Plastic Pet Carrier Basket Puppy Small Dog Cat Kitten Rabbit Travel Cage . Dispatched with Royal Mail 2nd Class. BASKET TRANSPORT ZOLUX GM PINK. Bottom of the removable basket for easy cleaning. Grilles of ventilation at each end of the basket. Worn on the shoulder or by hand (ergonomic padded handle, shoulder strap supplied). In excellent structural condition, but could do with a clean. BASKET TRANSPORT ZOLUX MM. Bottom of the removable basket for easy cleaning. Grilles of ventilation at each end of the basket. Worn on the shoulder or by hand (ergonomic padded handle, shoulder strap supplied). Removable bottom FOR ANettoyage facile. Air vents at each end and on the side of the basket. wear shoulder or by hand (ergonomic padded handle, shoulder strap supplied). Basket den for dogs and cats. W x D x H: 45 x 39 x 42 cm. We are here to help!